A critical piece of the Central Delaware Master Plan fell into place recently. The Delaware River Waterfront Corp awarded a contract Whitman Requardt and Associates LLP to conduct a traffic study of Delaware Avenue from Oregon to Allegheny Avenue. 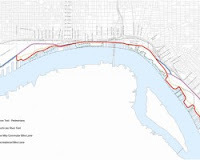 The study, to be completed by the end of July, will provide the necessary analysis required to shift biking the Delaware from distant urban aspiration to tangible urban investment objective. A multi-use trail along the Delaware River is a central piece of the revitalization of that waterfront. Such a trail would attract pedestrian and bicycle traffic, improve Philadelphia's burgeoning green image, and bring an incalculable boost in mood for those traversing our eastern river. Building momentum for its creation requires the statistics generated by this study. The traffic study will show whether Delaware Ave can handle vehicular traffic with fewer lanes, the creation of a trail, and allow trail advocates a seat at the table with the river's commercial and industrial stakeholders. This is a first and necessary step towards the Nutter Administration's vision of a green, pedestrian and bicycle-friendly Delaware River. This summer, we can look forward to the injection of new information, and new momentum, into the redevelopment of the Delaware waterfront.